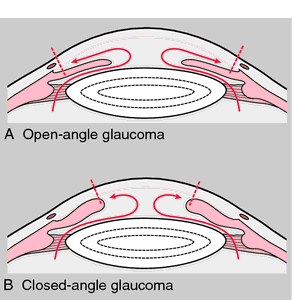 /an·ti·glau·co·ma/ (an″ti-glaw-ko´mah) (-glou-ko´mah) preventing or alleviating glaucoma. 1 preventing or alleviating glaucoma. Adverse effect of topical antiglaucoma drugs on the ocular surface. b) Both eyes receiving the same antiglaucoma medications and dosing which currently included an FC of 0. Eight-year outcome of trabeculectomy has shown that the treated eyes had well-controlled IOP, mostly with no adjunctive antiglaucoma medication at the end point of the study. An informed consent was taken where the procedure of Nd: YAG laser capsulotomy and the intervention using two different topical antiglaucoma medications and their side effects were explained. 35 antiglaucoma medications where used by patients prior to surgery, 2. Antiglaucoma beta blockers may change blood sugar levels, and may mask some signs and symptoms of these conditions, such as fast heart beat and trembling. The ocular side effects can be prevented by using swimming goggles, standing in front of a mirror to observe the path of the inhaled spray, continuing antiglaucoma measures, and using ipratropium and albuterol separately. Antiglaucoma Carbonic Anhydrase Inhibitors as Ophthalomologic Drugs (Francesco Mincione, Andrea Scozzafava, and Claudiu T.
24) compared ocular parameters between PEX-positive and PEX-negative eyes in 49 subjects with unilateral PEX syndrome and reported that, compared to PEX-negative eyes, PEX-positive eyes had lower visual acuity, higher IOP, lower corneal endothelial cell density, thicker lenses, lower anterior chamber volume, higher flare values and required more antiglaucoma medications. Outcome measures were control of IOP below 23 mm Hg (with or without antiglaucoma medications) and changes in visual acuity. Eyes were considered to have increased intraocular pressures if post injection IOP was equal to or greater than 22 mmHg after triamcinolone injection and/or antiglaucoma medications were used to keep IOP under 21 mmHg. Two eyes had a transient elevation of IOP and were well controlled by topical antiglaucoma medications.